While scrolling through the hundreds of tweets I receive on a daily basis; I found a nice chart that truly keeps things in perspective for me and I hope you as well. The stock market is up 100% and that's amazing (Reference 1). The Fed has done it's self described job of inflating the only asset class they can - Equities. While their mandate is generally described as keeping inflation well-managed and attempting to support full employment, the Fed has also managed to finagle their way into asset bubble creation and destruction. So, let's not get too carried away with the 100% thing. 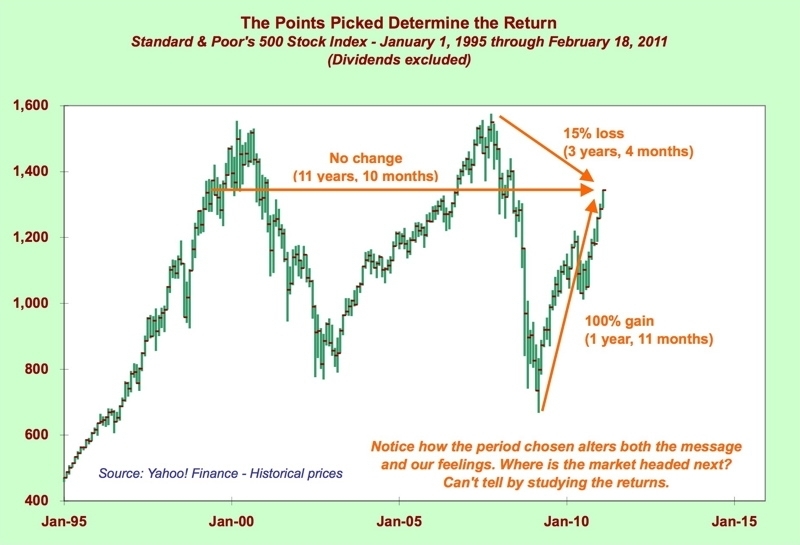 As seen in the chart over a three year period we are still down and over a longer term period the markets are at the same level as they were in 1999. This does not bode well for long-term wealth creation. However, the past is what it is and there really is no point in spending too much time being miserable about the last 11 years and 10 months. Probably more important for us to look at are the likely scenarios for the short and intermediate future. Here's what we believe based on the Bespoke Economic Indicators in reference 2. The business environment is improving. What once started off as a very slow recovery (the last 1 1/2 years) is looking to turn into one with more departure speed. Our friends at Bespoke Investment Group do a nice job of summarizing the changes to economic indicators. Green is good, Red is bad. As little as 6 months ago we saw lots of declining indicators. Of course this is a 10,000 ft level view of the macro picture; however, the point is things seem to be improving even if they are still negative in some areas like housing. Much of this can be attributed to the Fed’s use of quantitative easing as a policy tool. See my earlier blog on how easing works. Will we reach departure speed? Corporate earnings and revenue can be a guide to how much fuel is in the economy. With earnings season wrapping up on Tuesday, we have seen 67.4% of companies beat earnings estimates about 2 percentage points higher than last quarter. Revenues have also improved with 70% of companies reporting better revenue and if the quarter ends this way, it will be the best quarter for revenue since Q4 2009. On a going forward basis, 8.7% of companies have revised earnings guidance upward with 6.6% revising downward. Overall, the short run earnings are strong supported by revenue and expectations for decent earnings in the future. So while it feels very frothy in the equity markets relative to the last year or so, there is some reason to believe we may see an overall positive year in equity returns for 2011. I won't attempt to tell you the exact path we'll take. Likely it will be bumpy, frustrating and at times sleep deprived. However, if we as investors and advisors can manage our time horizons correctly we may be able to improve our odds of success.